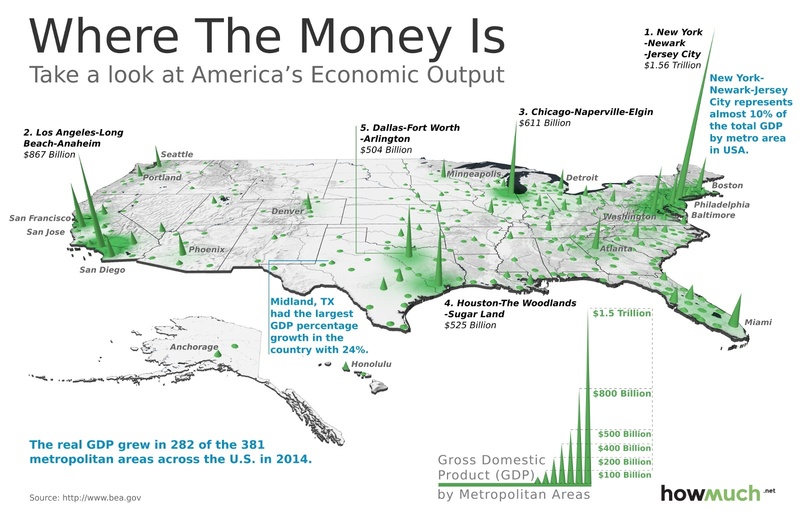 We built a map to provide a 3D visualization of the GDP by metropolitan area, seen below. The higher the cone rising out of the map, the greater the GDP in that area. In analyzing the data, we found that the top 20 metropolitan areas represent over 52% of the total GDP in the United States. GDP grew 2.3% for all metropolitan areas in 2014, after increasing 1.9% in 2013. As shown by the map, the New York metropolitan area, which includes Newark and Jersey City, lead the country with $1.5 trillion in GDP. The area had GDP growth of 2.4% in 2014. The New York metropolitan area provided almost 10% of the total GDP for the entire country.